Note 2: MSH(Market structure high), MSL(Market structure low). Note 3: entry must be in double lot. Zigzag indicator shows the resistance and support levels clearly with no need for any horizontal lines drawing and thats better for eyes clairvoyance. Equidistant channels shows the recent behavior for the price and its borders plays an important role in supporing and resisting. EMA(55) and EMA(200) plays usually an important role in supporting and resisting on four hours chart. 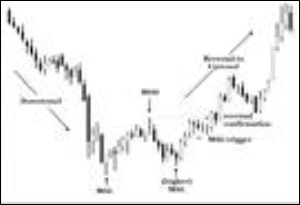 MSH and MSL are trend reverse patterns where MSH appears during an uptrend when the price candle or bar makes two higher highs(a,b) before making a lower high(c) due to a lack in bullish momentum and MSL appears during a downtrend when price candle or bar makes two lower lows(a,b) before making a higher low(c) due to a lack in bearish momentum. If entry orders (buystop or sellstop) are not triggered and a new low or high appeared this will invalidate them, so delete. Trades will be entered also if MSH and MSL were not near a support or resistance level but in caution where no support-resistance barrier is in our way and only if the patterns are included in at least 4 candles or bars formation. The entry must be in double lots where the stop is below b by 10 pips and target1=stop and target2=stop*2 where stop is moved to breakeven when target1 hit (Use trailing stop). 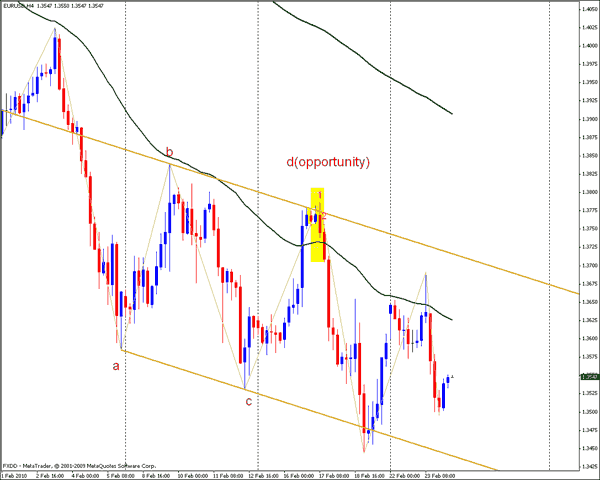 1: MSL is near zigzag peak but order is invalidated as the last low(b) is broken. 2: Invalid pattern as we have MSH according to 2 candles only. 4: Valid MSL on EMA(55). 5: Invalid MSH as EMA(55) is a barrier infront our trade. 6: Valid MSL although we are not near a support area because of a presence of 4 candles and as we have no barrier infront of our trade. 7: Valid MSH for same reasons as 6. 8: Valid MSL for same reasons as 7 and 6. 9: Valid MSH for same reasons as 8,7 and 6. 10: Valid MSL for it is at the lower border of an equidistant channel. 11: Invalid MSH for we have a support barrier infront our trade which is the lower border of the equidistant channel. 12: Valid MSH as it is at resistance level. Submitted by User on December 22, 2010 - 01:55. Submitted by User on August 26, 2010 - 09:14. I disagree that it's stress free. I read it and I got stressed. Submitted by User on June 21, 2010 - 11:08. Submitted by Tom on June 4, 2010 - 12:54. I am not sure If I am following rules correctly? For How long have you been using this method? Do you think it would work in the long run? Submitted by Mohamad on February 24, 2010 - 01:05. Submitted by User on February 23, 2010 - 16:36. Hi, Mohamad! Please explane: where i've to set order. Could U please attach picture? Submitted by Mohamad Mounzer on January 31, 2010 - 08:08. NO.. I donot mean that.. But i need at least four candles in order to avoid consolidations, so for the pattern to be more effective it must be formed after a clear wave, and 4 candles=16 hours includes at least 2 markets action.. thats all.. Submitted by User on January 27, 2010 - 09:14. Thanks for sharing your strategy. 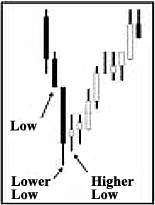 Could you please comment on the point: "only if the patterns are included in at least 4 candles or bars formation". 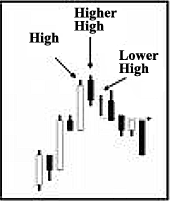 Does this mean you need to have 3 bars closing with higher highs followed be 1 bar closing with a lower high (MSH) before you have a valid setup? Do the bars also have to make higher lows and a lower low for the last bar? Thanks. Submitted by Kenny on January 24, 2010 - 10:12. Thank you so much Mohamad. Submitted by User on January 22, 2010 - 23:28. Thanks for your explanation of MSH and MSL. Submitted by Edward Revy on January 22, 2010 - 21:55. If you happen to have a better one, it would be great to have it posted. Submitted by Mohamad Mounzer on January 22, 2010 - 00:44. It differs from a software to another.. 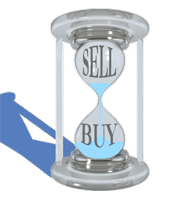 I advice U to choose Buystop and Sellstop orders when market is ranging or choppy, but when market is trending U have to choose the orders that goes with the trend and ignore the others as they are only corrective. 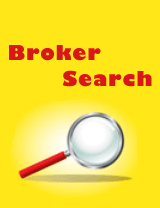 Watch MSL(market structure low) and MSH(market structure high), and read more about them. BUt the most important is that U cannot put all that on ur chart U will make it very crowded and annoying and U may not find a place for trade..
Just choose some from them.. 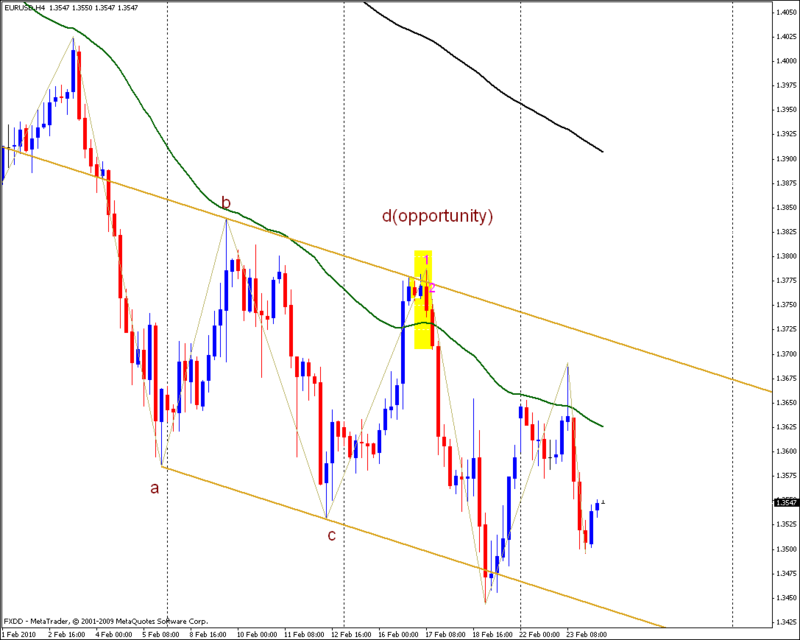 I choosed in my strategy the : previous tops and bottoms by using ZIGZAG, 2 moving averages ,equidistant channel.. Submitted by Kenny on January 20, 2010 - 19:48. Can you help me? I am a total newbie to forex - I've had a few unsuccessful trades based basically on gut feeling and lost a couple of hundred dollars. I don't want to waste any more and am looking for a decent strategy. I have invested another $500 in my live account and will not be investing any more. This is my last try... I have been looking around for a decent strategy and came across this site. I like the look of your strategy. Can you explain the system to me more basically, step by step, to set it up? One question, do I need to watch prices all the time to 'switch on' my trades or can this be set up to switch on automatically? I don't have a lot of time to watch the prices as I work full-time and have a busy life. Your help really would be appreciated! Submitted by Mohamad Mounzer on January 19, 2010 - 02:46. U can use RSI and Stoch also U can use Fibonacci pivots and any thing else..
and adding more indicators will filter more but also will make u miss more.. 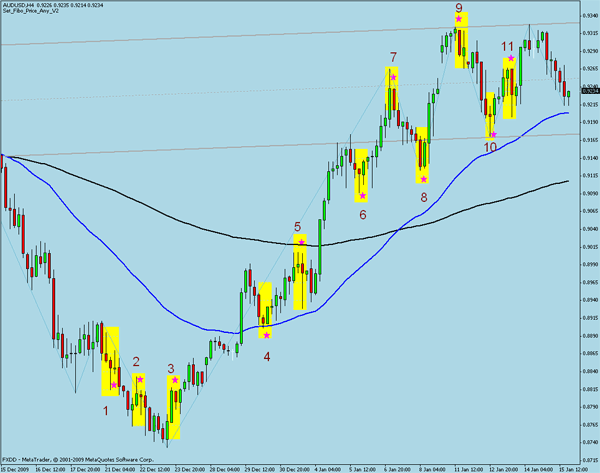 Submitted by khaira on January 18, 2010 - 16:08.
its awsum.... an added indicator (i wud use stoc & rsi combination ) would make it almost fool-proof..
thnx fo the lovely strategy..